White Linen by Estee Lauder is a classic, timeless scent that manages to be both exhilaratingly fresh and at the same time complex and lasting. I wore it in the 80s and was only recently reminded of it by a much younger colleague who had discovered its appeal. Wearing it again is like meeting up with an old friend. Anyone can see why this fragrance is still alive today. I've used White Linen Perfume off and on for many years. It's an unforgettable fragrance. 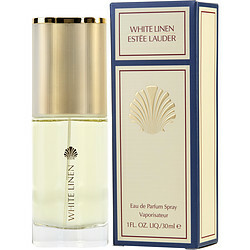 I bought White Linen by Estee Lauder for my Mother this Christmas and she absolutely loves it! She says it reminds her of her youth from the 90's. And she's right to love it because it smells HEAVENLY! It's very sophisticated and pretty and not over-powering. This was a gift to my wife; she was happy with this perfume! !